When does it make sense to undergo a wrist arthrodesis procedure? What causes osteoarthritis to the wrist joint? Are there any options to a wrist arthrodesis (total wrist fusion)? When should a wrist arthrodesis be carried out? What is the purpose of a wrist arthrodesis (total fusion of the wrist)? Is there a naturopathic approach as option to a wrist arthrodesis? 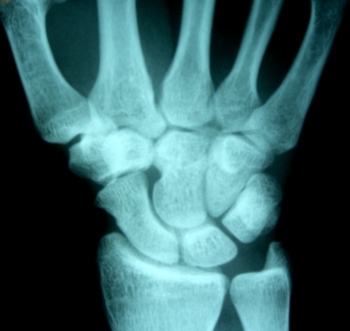 Ordinary x-ray image of a wrist joint. The image to the left shows severe osteoarthritis to the wrist joint while the x-ray image to the right shows a healthy wrist joint. The image to the left clearly shows that there is no room between the radius and the carpus thus there is no cartilage left. Bones that form a joint are covered on the surface with cartilage tissue. Cartilage tissue – as opposed to bone tissue – cannot be displayed in an x-ray image. Therefore a healthy joint always shows a joint space in an x-ray image. This joint space or line corresponds to the thickness of the cartilage layer. If the joint space is missing or looks severely narrow in an x-ray image, the reason is that the cartilage tissue is missing. When you have missing cartilage tissue you are looking at a typical clinical picture for osteoarthritis. The radius is fractured. In fact, you are looking at a very severe fracture here. 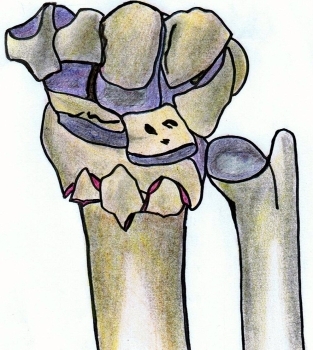 The joint surface of the carpal bones is destroyed. 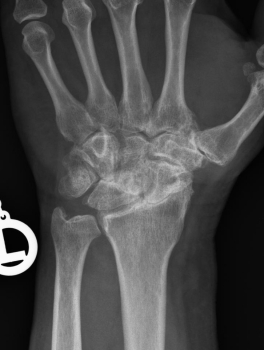 Fractures like these may end up developing wrist joint osteoarthritis over the years or decades. Yes. Each option has to be carefully evaluated on a case-by-case basis. If, for instance, there still is fairly good mobility and the condition has not progressed too far, a denervation of the wrist joint may be considered. This intervention focuses on the interruption of the pain-conducting nerves of the wrist joint. Another option may be a partial fusion of the wrist joint. In rare cases the implantation of an artificial wrist joint may also be contemplated. It is good to know that such an intervention can never be carried out too late. The total wrist fusion deactivates the wrist joint and is geared towards the creation of a bony fusion between the radius, the carpal bone and the metacarpal bone of the middle finger. Whether such intervention turns out to be a success has nothing to do with the timing of the surgery. Therefore, as long as you are able to handle the discomfort or if you require more time to think it over you should not feel pressured into a hasty decision. There is no urgency to operate. A wrist wrap immobilizes the wrist joint. While wearing the wrist wrap, it will simulate a similar situation as it would apply to a wrist arthrodesis. As long as you are able to cope with the pain by temporarily wearing a wrist wrap, you may take your time prior to committing to a surgical procedure / a wrist arthrodesis. When affected by osteoarthritis to the wrist – regardless of what caused the condition – each motion as well as any strain put on the wrist may turn into a very painful affair. As a consequence this may lead to a reduced usability of the hand, as the concerned patient will most likely avoid any exertion. More often than not this also causes a patient to take strong pain killers over an extended period of time which will result in side effects. For these individuals a well carried-out wrist arthrodesis may represent a considerable advantage. In most cases after nine to twelve months the patients will be able to put their hand at much better use – despite the rigidified wrist joint – than before surgery. It is important to know that a painful joint which retains mobility is not very useful. A rigidified, stable, painless joint can be of much more use than a painful mobile joint! Generally speaking each treatment which is not too side-effect burdened while tackling the issue is better than a total or partial fusion of the wrist! Over the past years a number of reports on naturopathic therapies using leeches on joint conditions caused by various reasons have surfaced.